Our best hand shears for fitting and clipping wool sheep. The built-in rubber stops reduce "clanking" noise during use. The handles are powder-painted to offer an extra smooth finish for more hand comfort. Almost straight blade edges are triple ground. Recommended: 5 out of 7 said they would recommend this product to a friend. I been using the shears on our four Southdown sheep who have been filthy since we got them in lat November. The build quality seems good. The function reasonably well. They do need to be sharpened when they arrive. Perhaps its because I am a novice, I've noticed marked improvements in shearing ability when you slightly slice the wool when you cut (i.e. pull slightly back on the shears while cutting). The sheep are very filthy and the shears have a tough time getting through the grime. Pure JUNK, fake knock off Burdgeon and Ball's made in Pakistan. Does not matter how sharp or who sharpens them, they are absolutly worthless. These worked well on my Shetland sheep and I am going to use them on my llama too. I had never hand sheared before and was intimidated at first. But after a little practice got the knack of it. You do need to hold them at a specific angle to get a good cut, but again, after a few tries was able to sheer my ewes and my ram quickly with confidence. The trick is to not have to thick of a cut. If you lift the wool and slide the blade under you should still be able to see the blade, therefore ensuring that you are not cutting the skin. My sheep did not appear to be afraid of the sound the clipper blades make during the actual cut (kind of a swooshing noise). I am happy with the economical cost compared to an electric shearer as I have a small flock. The shears are noisy and the black stops do not reduce the noise. 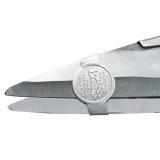 The shears are not sharp and have to be held at a very particular angle just to shear. One black stop fell out of the holder within the first 5 minutes of use. I was not able to cut 8 ply cotton yarn with these shears on the first attempt. 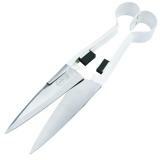 I have cheaper shears that are much sharper and less noisy. I must now package these shears, drive over 20 miles to UPS or 25 miles to the Post Office (one way) to return these shears for examination, replacement, sharpening, or refund. This product should have been sent ready to shear without this trouble. I bought these shears, after dulling all of my scissors (six pair!) trying to shear one of my Nigora goats. These shears have held up and are still going strong. They are easy to use (if a little intimidating!) and my hand didn't get tired. They are a little noisy, when the blades move back and forth across each other, but not too bad. My skittish goat didn't seem to mind at all!